Visit Lady Musgrave Island or Lady Elliot Island to snorkel with the incredible marine wildlife of the Southern Great Barrier Reef. You'll see turtles, manta rays, colourful coral and so much more! Visit Tinaberries to taste delicious fruit ice cream. With strawberry, lychee, mango and passionfruit, you'll just have trouble deciding what flavour to pick. Imagine you are the world-famous pilot, Bert Hinkler, and take the journey he did many decades ago at the Hinkler Hall of Aviation. Take a tour through the Bundaberg Brewed Drinks Barrel to learn about your fizzy favourites. See how the brews are bottled and packed, taste-test from 14 flavours and pick 6 to bring home to remember your trip! Have an animal encounter at Snakes Downunder Reptile Park & Zoo. Who wouldn't want to hang out with a cheeky meerkat! Learn to surf and SUP with Enviro Reef Paddle & Surf School at one of our beautiful beaches. We have so many to pick from like Kelly's Beach and Elliott Heads, you'll be a pro in no time! Throw in your togs and check out Woodgate Beach. If you're there on Easter Monday, 22nd April, take a stroll through the Easter Fair and pick up some goodies. Find clues and solve puzzles in the escape rooms at Bundy Bowl & Leisure Complex. While you're there, play a game of tenpin, laser tag and mini golf. Take a relaxing walk along the Bargara Esplanade and enjoy the ocean views. On the way, grab a drink and stop by the Turtle Park and Playground. 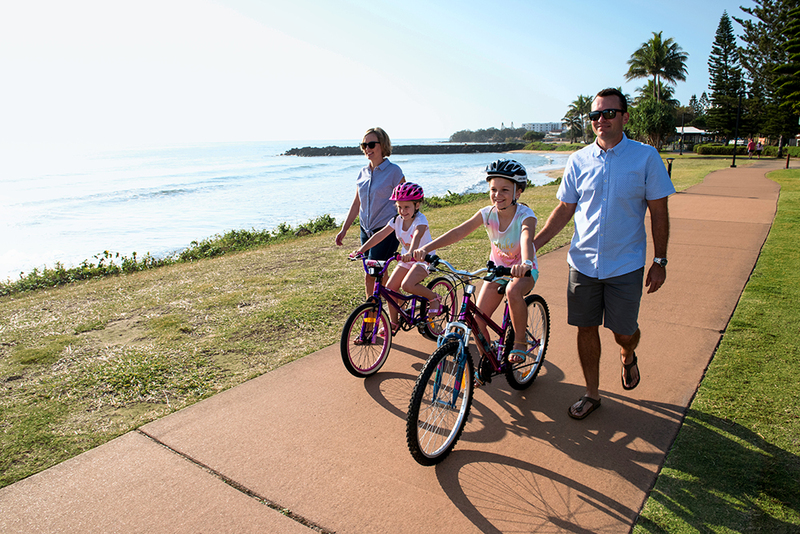 You can even bring your bike and cycle the turtle trail all the way to Burnett Heads. Admire the beautiful Burnett River while eating fresh seafood at Grunkse's by the River Seafood Market and Restaurant.